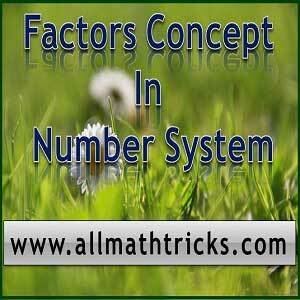 In number system the concept of factors of numbers is one of the important sub-topic. In this article, we will discussed about definition of factors of number, formulas for finding number of factors, sum of factors, product of factors, even number of factors, odd number of factors, perfect square factors and perfect cube factors for any number. Factors of a number any number “ P” refers to all the numbers which are exactly divisible on “P” i.e remainder comes to zero. These factors of numbers are also called divisors of a number. So 1, 3, and 9 are factors of 9. N = Ap x Bq x Cr here A, B , C are prime numbers and p,q,and r were respective powers of that prime numbers. Hi friends Thanks for reading. I Hope you liked this article ” Shortcut to Find Number of Factors of a Number”. Give feed back, comments and please don’t forget to share it. Please can you provide me the derivation on the equation of the getting the sum of all factors of “N” and product of all factors of “N”? And can you also provide explanation. Please reply, this is for my study. They wont promote me if i am not able to present this one clearly.